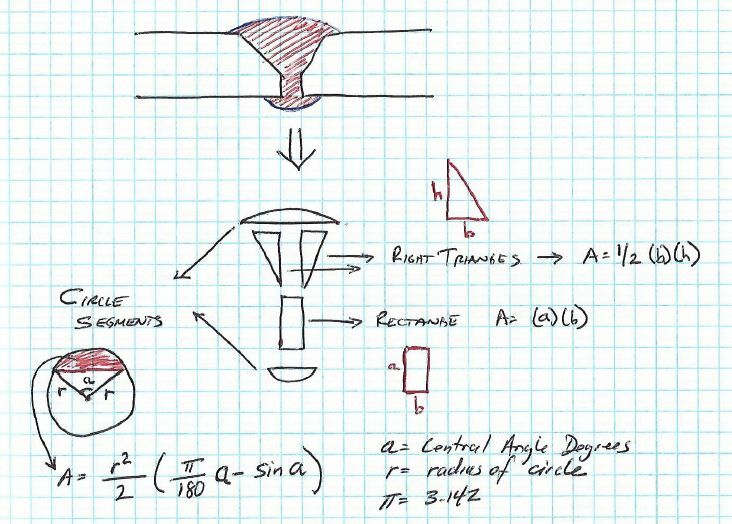 If you need to calculate weld metal requirements and you do not have The Procedure Handbook of Arc Welding handy you can do this by hand by using simple geometry. 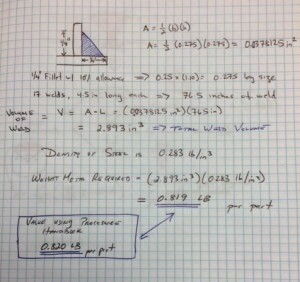 What you need to do is find the volume of weld needed in cubic inches. A fillet weld with a flat face forms a right triangle. Using high school math we can see that a right triangle with ¼” legs would have an area of ½ x base x height . Using our 10% allowance for overwelding our legs sizes would be ¼ x 1.1 = 0.275in. So our area = (1/2) x 0.275 x 0.275 = 0.0378 square inches. We have to weld a total of 76.5 inches per part (taken from the example on our previous post: Calculating Weight of Weld Metal Required) so the total weld volume for each part is (0.0378) x (76.5) = 2.89 cubic inches. Since we are welding carbon steel we use its density to calculate pounds of weld metal. The density of steel is 0.283 lb/cubic inch. 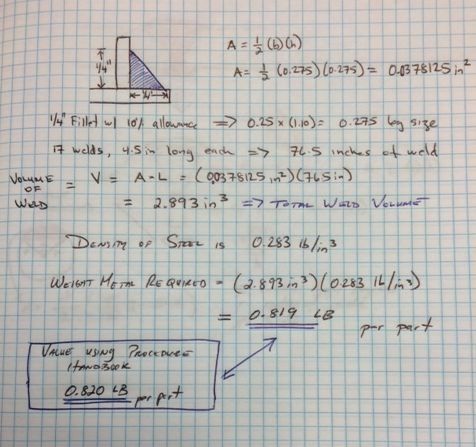 Calculating the volume of fillet welds can be done easily by using simple math. 2.89 cubic inches x 0.283 pounds/cubic inch = 0.819 pounds per part. We compare this to the values obtained from using Table 12.1 in the Procedure Handbook and we are dead on. 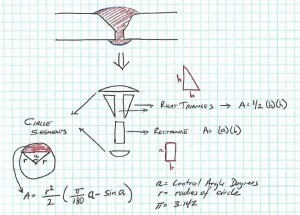 Calculating the volume of a groove weld gets complicated. We need to break it down into sections to do so. Instead of a simple triangle, we know take the cross section of the joint and divided into shapes for which we can calculate the area. In the notes above we see that we end up with 2 triangles, 2 circle segments, and 1 rectangle. For this type of joint, table 12-1 of the Procedure Handbook has what you need. However, when you start dealing with J-grooves and other complicated groove joints you may need to do it by hand. There are tables for these joints as well but it seems they are published in obscure books and technical reports. Hi again, I’m with a doubt that is killing me. I have to calculate the weld metal in a “V” joint for a job. Only I can not understand how to calculate the weld metal by “The Procedure Handbook of Arc Welding, 14th Edition”. You have step by step calculation for this joint? An application with practical data as the fillet weld. Thank you! Then use Table 12-1 to get and add up all the components of the weld. Can you provide the joint details? Follow the link to see the joint design. Matthew, please see our response via email. Have a few questions regarding the details. Willy, what exactly would you like to calculate? There are tables that can help with calculating weld metal requirements for different types of joints. However, if you don’t have these tables you can always calculate the weld metal needed by calculating the volume that needs to be filled. To do this you need to know the weld joint type and size of weld. You may also need to brush up on geometry. If you have a specific weld in mind please provide the details and we would be happy to walk you through the calculations.